Get all the latest model railroad news and views from the world of model railroading. trains as prototypes. As the name implies, every railway track system is a unique, one of a kind system. This explains why the phrase 'prototype train' is a good description for full size train. If, as a model railroading enthusiast, your aim is to create your own "real" system, then it is easiest to refer to full size trains as being prototypes. The terms scale and gauge are two of the most confused terms in the model railroad hobby. The SCALE proportion is expressed as a fraction of a real life-sized railroad. As an example, HO scale model train set is 1/87 the size of real life-sized railroads. For model trains, track GAUGE is the width between the inside running edge of the rails. For toy trains, track gauge is the measurement from the center of the two outside rails. locomotive that is on that piece of track will respond by moving forwards or backwards. lower the voltage, the slower the locomotive moves. 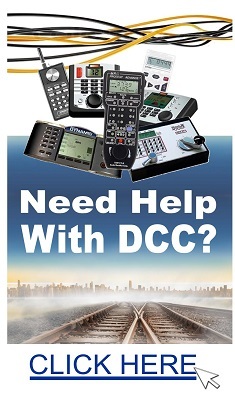 DCC stands for Digital Command Control. It is a system that allows model railroads to independently operate multiple locomotives, functions (speed, sound, lighting, direction, movement) and accessories rather than control of sections of railway track.This is achieved by locating a decoder in the locomotive that listens to information in the track. When laying 'loose' track ballast, be very careful while distributing it around point blades. Also, when laying 'loose' track ballast never run the trains until the glue has fully dried and the track has been vacuum cleaned to ensure no loose track ballast remains. When making scenery for a model railway layout there is a temptation to make trees too small. This probably because many people live in housing developments that were built less than 40 years ago. In real life mature trees can be huge with some trees being 80-100 feet or more in height. If you are modeling conifers or other very large trees here's what to do. Take your longest passenger car, turn it up on end, and make the trees taller, up to half again as tall. When positioning your trees on your model railroad, keep in mind the loading gauge of your widest and longest rolling cars. Check to see if the trees will be too close to the tracks BEFORE you glue them into place. Terminal, Park Avenue and 42nd Street, New York City, USA. The station has 44 platforms situated on two underground levels with 41 tracks on the upper level and 26 on the lower level. Around 200,000 commuters arrive and depart on approximately 550 trains every day. Grand Central was built over a 10 year period from 1903–13 and covers 19 ha (48 acres). The Australian National Railways Trans-Australian line over the Nullarbor Plain, is 478km. (297 miles) dead straight, from between Nurina and Loongana, Western Australia, to between Ooldea and Watson, South Australia. As the name implies, the Indian Pacific Train travels from the Indian Ocean all the way to the Pacific Ocean. This famous ocean to ocean train trip across Australia is one of the world’s longest and greatest railroad journeys. This railroad journey from Sydney (on the East Coast) to Perth (on the West Coast) covers 4352kms. The Indian Pacific Train travels from the spectacular Blue Mountains to the treeless plains of The Nullarbor, where the train travels the world’s longest straight stretch of railroad track (478 kilometres). Passengers experience three nights aboard the train as well as scheduled stops at Broken Hill, Adelaide and gold rich Kalgoorlie. A remote outpost on the Nullarbor Plain called Cook, population 2, presents a further opportunity to stretch your legs. The Indian Pacific passenger train first ran in February 1970 from Sydney Central to East Perth linked New South Wales, Victoria, South Australia and Western Australia but by-passed Adelaide, the capital of South Australia. The Adelaide rail terminal (with standard gauge connection) was opened in May 1984.
railroading enthusiasts to add to their model railroad layouts. The A1 4-6-2 is presented in LNER livery with four teak coaches to represent the period of non-stop running between London and Edinburugh over the summer seasons of the 1930s. Hornby even have a complete 'Flying Scotsman' model railroad set containing everything needed to just set up and run including: a transformer, controller and track. The longest railway journey in the world without changing trains is 6,346 miles (10,214km. ), from Moscow, Russia, to Pyongyang, North Korea. The train trip takes almost eight days with only one train a week taking this route. scale, HO scale and N scale model railroading. Inside the Golden State Model Railroad Museum, you will find three large model railroads, constructed and operated by the East Bay Model Engineers Society (EBMES). When visiting California the Golden State Model Railroad Museum is well worth seeing. The museum is located in Point Richmond, California (just north of San Francisco, at the north end of the East Bay). The Greater Midcontinent Railroad Company was founded in 1991. The HO scale model railroad layout occupies approximately 20 by 30 feet of the basement of the Garrett Historical Society Museum. The model railroad layout has about 7 scale miles of track, which typically takes 20 minutes for trains to complete a circuit. Prototypical operations are duplicated with the aid of a computerized system which controls the model railroad layout.